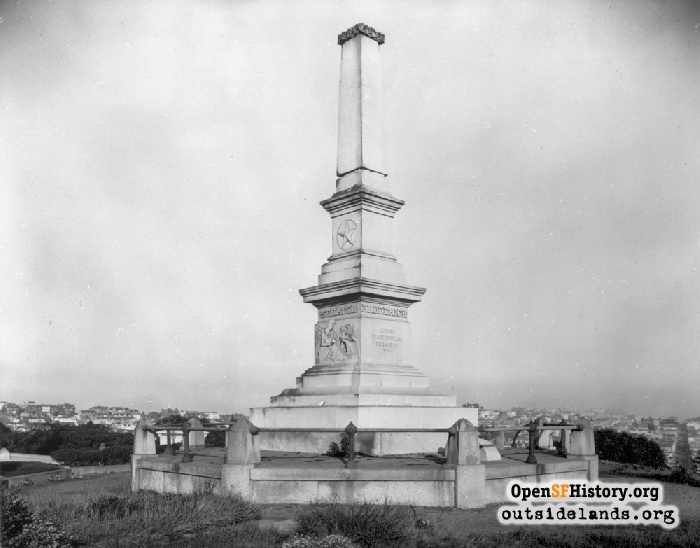 Resting place for prominent San Franciscans beginning in the 1850s. Location: Bounded by California Street, Geary Boulevard, Parker and Presidio Avenues. Renamed: Laurel Hill Cemetery in 1867. Closed: Bodies moved in 1939-1940 to Cypress Lawn Cemetery in Colma, California. 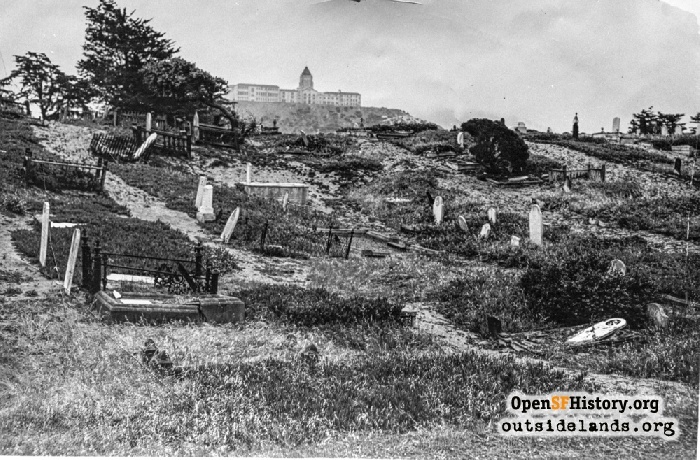 The young city of San Francisco had previously buried most of its dead at the Yerba Buena Cemetery, where the city’s Civic Center is today. The site had been considered outside of town at the time of the cemetery’s establishment, but by 1853 the city needed a larger, more remote burial ground. 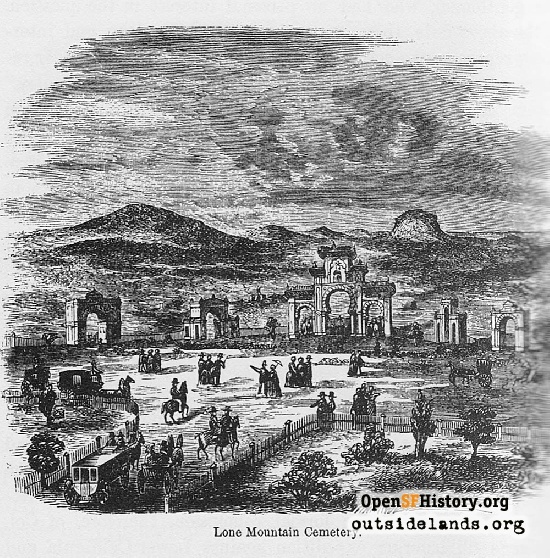 Originally, Lone Mountain Cemetery was intended to be 320 acres and to encompass the western eminence for which it was named. 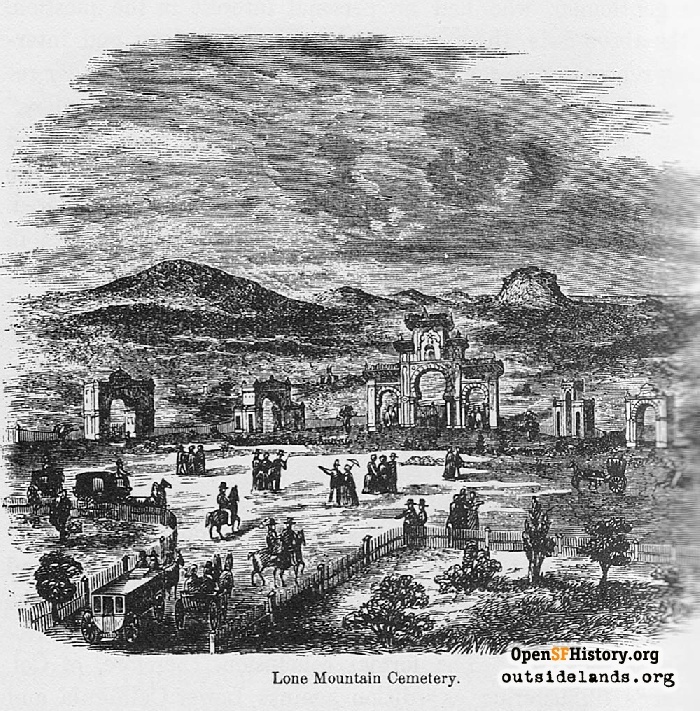 A year later, however, according to The Annals of San Francisco (1855), the cemetery planners “found that one hundred and sixty would form a sufficiently large cemetery.” Thus, from its beginning, Lone Mountain Cemetery was only in view of its namesake. "There are many beautiful spots within this space. Delightful dells, scooped out among the hills, with the evergreen oaks bordering and fringing their quiet beauty; valleys smiling all over with flowers, of every hue, and knolls covered with shrubs, rejoicing in their crowns of white lilac. The views are as various and sudden as the avenues and their turnings. There are portions full of hidden springs, and, in a word, the spot is capable of being made one of the most delightful in California." The winding lanes and avenues between the rows of burial plots were named after large East Coast cemeteries such as Mount Auburn (Massachusetts), Green-Wood (Brooklyn, NY), Oak Hill (Washington, D.C.), and Laurel Hill (Philadelphia, PA). The addition of the “Outside Lands” to the city of San Francisco in the 1860s created a battle over the administration of Lone Mountain that went to court and was eventually resolved in 1867 with the formation of a new cemetery association and a name change to Laurel Hill Cemetery. 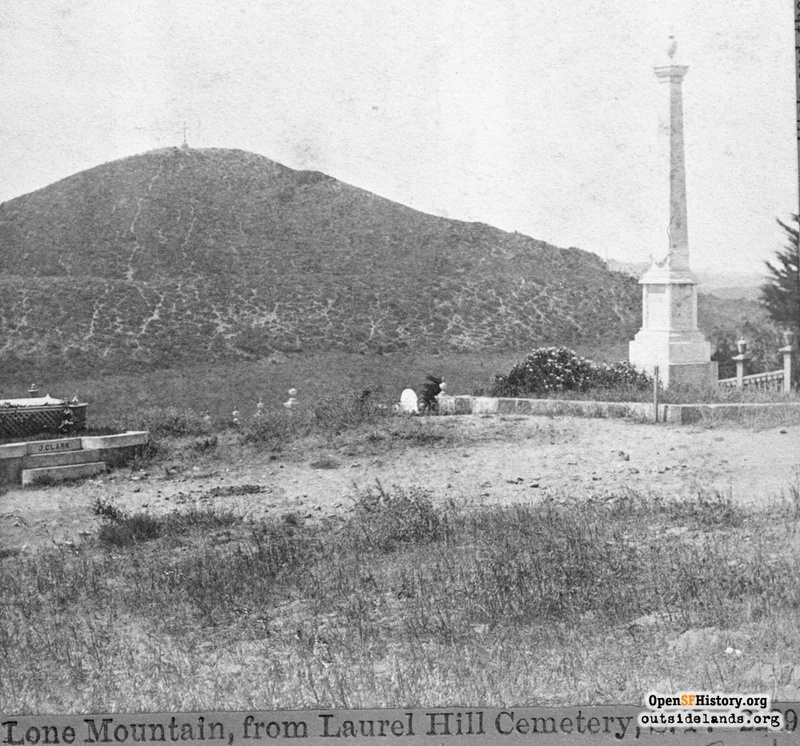 Despite being the “final” resting place of many San Francisco pioneers, U.S. senators, and Civil War heroes, Laurel Hill succumbed. From 1939 to 1941, some 35,000 bodies were reinterred, most to Cypress Lawn Cemetery in Colma, California. The Laurel Heights neighborhood stands on the site today.